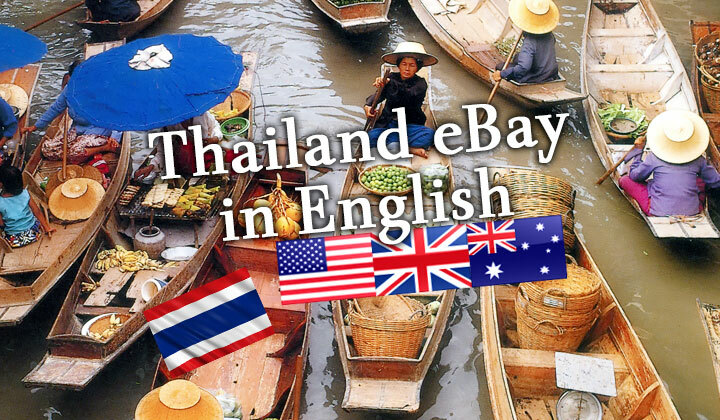 Biggest Southeast Asian online retail seller market on eBay is in Thailand. It’s where Thai business is booming, connected to an English language customer base. Or: See Lazada for biggest English language online store in Thailand. The California based e-commerce firm has been considered the holy grail of exports to anything from small to big-size businesses. With one of the vigorous South-east Asian markets for product manufacture, Thailand has managed to surpass Singapore, Vietnam, Malaysia, Philippines and Indonesia in trading value as well as the number of sellers on the eBay platform. While the country has embraced it’s business-to-consumer functions, consumer-to-consumer and auctions services have been less popular within the country. However plans are to extend business within C2C in which we are likely to see increase, while keeping it’s main stance on export. They website at ebay.co.th is targeted towards local sellers seeking information on using the service, only in Thai language. All eBay services, including those that are targeted towards Thailand consumers can be found at the main eBay.com website. For making purchases in Thailand, Lazada.co.th is the most popular as well as modern e-commerce portal with full smartphone support. No other website has been able to match the services of eBay within Thailand itself. The company is offering a shopping experience similar to big online department stores around the world with anything from electronics to fashion and other consumer goods. Lazada is also conveniently available in English and very popular with visitors and expats living in Thailand. Have questions or want to share something about e-commerce in Thailand? I would much appreciate your comment below, thank you. Hi. I am hoping to achieve the impossible. My Thai wife wants to buy her elderly father ( who is a monk ) an electric heater as he is now feeling the cold up in Chum Phae , Khon Kaen. To buy and post from the UK would cost an extortionate amount in postage. Do you have the capability to find and post. I have a PayPal account and would very much appreciate your help. Thanks. Or why not use Lazada? tel him to buy a heater in his village and tel your wife to stop making you buy some thing for her family .you got your own worries .i have a thi wife and i told here i am not a money bank for the famely be carful they have sucked many a english guy to nothing then just get a nother one .tell here you have no money and if she love you u she will stop bothering you. Go to Global House and buy the oil filled radiator, they work very well, and are energy efficient! I bought one for my MIL here in Lampang last year and it worked great! Just get him to look in a big c store, robinsons or Tescos etc and send the money over. Thanks for the advice. They did not have any local though. That would have been the simplest option. Got one from asda in England and posted it. Only cost 17 pounds to post. I have been purchasing products on lazada. I dont speak thai and postman doesn’t speak english… yet i am getting stuffs done on time with cash on delivery only. (Not being able to speak thai language is really difficult to reply the phone call from post office). how do I buy a pair of cruches on this site?